Submit your details to enroll in our automatic prescription refill program at Express Care Pharmacy. Get a refill of your prescription. We will fill your prescriptions fast, accurately and affordably! Express Care Pharmacy accepts payments through most major insurances. View the list! Express Care Pharmacy is your good neighbor pharmacy in the Dallas/Fort Worth area with excellent professionals who will take care of your prescriptions and non-prescriptions medication needs. At our pharmacy in Carrollton, TX you will find competent and caring pharmaceutical professionals who are well-trained to help you with your healthcare concerns and questions. Our prescription is to give you more. 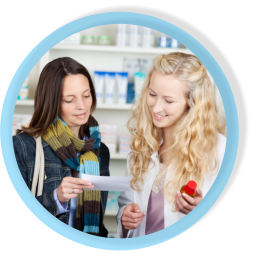 Ask questions about your prescriptions to our excellent pharmacists and they will guide you to the maze of information about staying healthy. Well, are you concerned about the price of your prescription? Call and talk to our associates about our wonderful, generic drug program. Reach us out at 214-800-5526. Want to save a trip? We can deliver your prescriptions. *** ***Some restrictions apply.